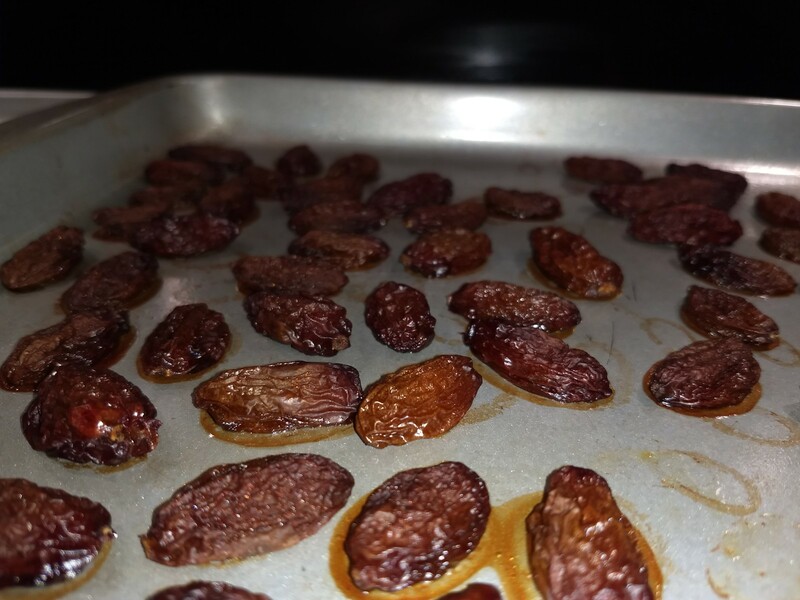 Dehydrated Grapes Become Delicious Homemade Raisins! Yesterday it came to my attention that some grapes that were forgotten in the back of the refrigerator were shriveling up and should be thrown away. Nonsense! They are starting to look like raisins anyway, so let's make them into raisins. I took a baking sheet and sprayed it with a light coat of non-stick spray. 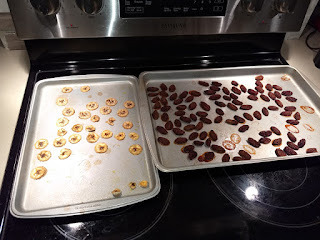 Then I pulled all of the grapes off of the stems and arranged them in a single layer on the baking sheet. Fortunately, my oven has a dehydrate setting that runs the oven at 150 degrees and also runs the fan. If your oven doesn't have a special dehydrate setting, set it to the lowest temperature. Put the grapes in and let the oven run overnight. Even stale grapes turn into delicious raisins. The raisins I got from seedless red table grapes are much larger and more flavorful than store-bought raisins. My homemade raisins are probably at least 5x the size of standard raisins. I left mine slightly moist in the center. They taste like they are filled with grape candy filling, but they are entirely natural grapes. Don't Throw Away Those Bananas! As my grapes were on their way to becoming raisins, I noticed some bananas on the kitchen counter that were starting to turn brown. The usual plan for overripe bananas is to make banana bread with them, but this is a lot of work and banana bread is not very health to eat anyway due to high fat and calories. Since I had the oven running anyway, I decided to spray a second baking sheet with non-stick spray and proceeded to cut up the excess bananas into coins about 1/4 inch thick. 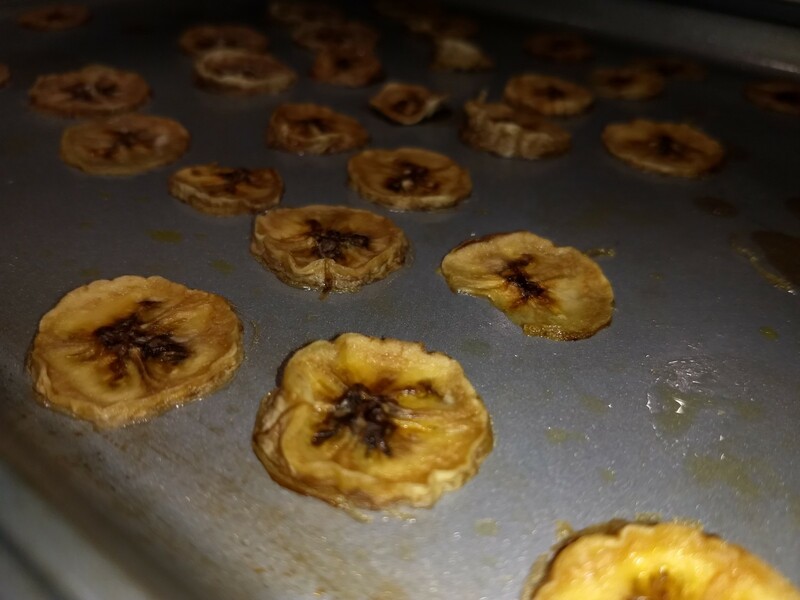 After about 5 hours, the bananas were dehydrated and tasted delicious. The banana flavor was concentrated and these bananas will definitely get eaten instead of going to waste (or going to waist in a banana cake). 3. Place your fruit on the baking sheet. Cut fruit into coins or strips. Rockstar Rumble: Best Money Blog Post of 2017! I am excited to learn that one of my blog posts has been selected as one of 128 competitors in the Rockstar Rumble tournament to determine the best money blog post of 2017! The answers to both of these questions are revealed in this thought-provoking and memorable post! The winner of "best blog post of 2017" will be selected in the Rockstar Rumble through a series of matches between competing blog posts in a bracket-style tournament. Readers get to vote on their favorite of the two blog posts in each match to determine the winner. The first round of the tournament with 128 competitors will be reduced to 64 after the first round, then down to 32 after the second round, etc. 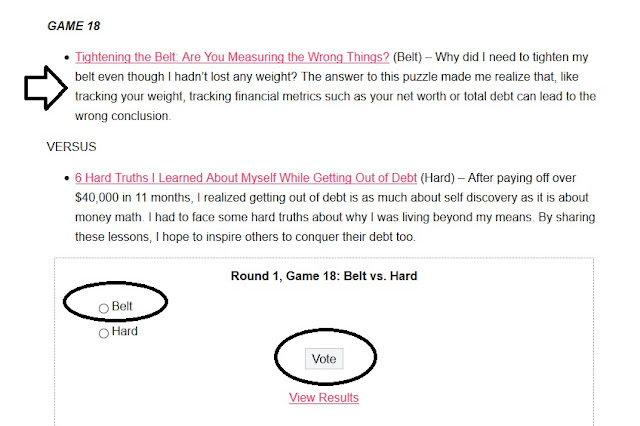 My first face-off in Round 1 is against a post called "6 Hard Truths I Learned About Myself While Getting Out of Debt". This is a well-written post, and it is organized around a list with a specific number of points which is a popular style these days. Vote for my entry "Belt" in Game 18! Voting has concluded, and my opponent has won the game, 64 votes to 49 votes. Congrats to Jenny at goodbetterlife.com. Thanks to Rockstar Finance for setting up the tournament, and thanks all for participating! If your household budget is like mine, you know that food is a major expense. Food is an expense you can easily cut through planning and thoughtful effort. But how can you cut food expenses without going hungry? The answer: Meal Planning. I am not very good at meal planning, but fortunately we have a guest post today from Holly who posts on the Official Coupon Code blog that takes you through the steps to follow to save big-time on your grocery budget. If you want to see your writing featured here on Penny Pincher Journal, here is how you can be featured on a guest post. Thanks to Holly for providing this awesome guest post! Do you spend too much on food? Maybe you have a drive-thru habit because it’s just easier than figuring out what to cook? Perhaps you find yourself throwing away a lot of spoiled food that never got used? Or maybe you find yourself running to the store for one or two ingredients before you can start dinner? Relax! Meal Planning is a great way to solve all of these problems, and it’s a lot simpler than you might think. I’ve been planning my household’s meals for several years now, and have managed to cut our grocery/food budget in half. Plus, meal times are a lot less stressful. I can just look at my plan and I’m ready to cook! Perhaps you don’t know how to get started or think it’s too difficult or time-consuming. Not so! If I can do it, so can you. Here’s how. First things first: start by taking stock of the food you already have. A quick glance through the pantry, fridge, and freezer may reveal ingredients you forgot about. Get a good idea of about how long each item will last and plan to use them accordingly. You should also be aware of which pantry staples you normally keep on hand, and replenish them as they get low. This step can be as adventurous or as mundane as you choose to make it. Personally, I like to have at least 2-3 new recipes on my list each week. It keeps our family meals fresh and appealing. Others may like to stick with familiar favorites. Either way is fine! The important thing is to have a plan in place. If you’re looking for new recipes, the internet offers a variety of options. I often use sites like SuperCook or MyFridgeFood to find recipes that use ingredients I already have on hand or ones that are on sale this week. You can also search sites like Pinterest or AllRecipes to find new and different ideas. Or subscribe to email newsletters from your favorite food blogs or magazines to get recipes delivered right to your inbox! There are some great, free tools out there for turning recipes into shopping lists. My personal favorite is CopyMeThat because it does all the work for me. I also love that I can simply pull up the shopping list on my phone while I’m at the store. Of course, the old pen and paper method works too, if you prefer. The important thing is to choose what works for you – the easier the better! Include breakfast, lunch, dinner, beverages, household items, and snacks too. You want to make just one trip to the store for the whole week. Once you have all of your ingredients listed, check off anything that you already have. It may help to sort items by category too, so you can easily find everything at the store. And don’t forget to check for coupons! So, you’ve planned your meals and bought all the food you’ll need for the week. Now you’re done, right? Well, you can be, but to really get the most out of meal planning, it’s best to do some prep. If you’ve seen those containers of pre-chopped veggies or pre-mixed salads at the grocery store, you’ve likely been a bit shocked by the prices. They can get away with charging so much because having pre-prepped ingredients makes cooking a breeze. Take advantage of this idea on the cheap by prepping as much as you can for the week, all at once. I find that in an hour or so on a Sunday afternoon, I can get all the chopping and portioning out of the way for the whole week. If I know some days are going to be particularly rushed, I’ll use freezer meals to get us through. These are recipes that you make in advance, then freeze. On the day you’re going to use them, just thaw and pop them in the oven. Dinner’s done! The most important thing is to make your meal plan work for your family. Sometimes that means veering off course and changing things up for a day. Sometimes it means reworking a recipe to fit what’s going on in your life at the time. Last week, when my husband came down with the flu, I converted a chicken marinade into a tasty chicken soup by adding a carton of veggie broth and slow cooking it all day. The idea is to have a plan for the whole week, and stick to it as much as possible, but remember to be flexible when needed. You’ll be amazed at the time, food, stress, and money you can save just by spending a little time planning ahead! About the Author: Holly is a freelance writer and a regular contributor to the Official Coupon Code blog. There you can find her tips on saving money, couponing, personal finance, and frugal family fun. Our family recently got back from a winter road trip from Iowa to Florida, about 2,700 miles round trip. 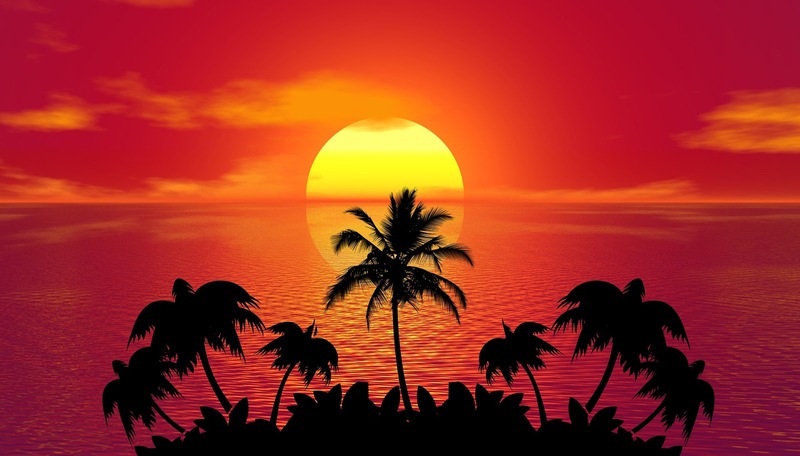 It turned out to be a great time to head south since the high temperature in Iowa was below 0 degrees, and the high temperature in Cocoa Beach, Florida was 80 degrees. We were able to swim and hang out on the beach all day. Take a Cheap Winter Road Trip! We thought about stopping in Orlando to visit attractions such as Universal Studios and Disney World, but decided the beach is where we really wanted to be instead. It cost us $20 to rent beach chairs and an umbrella all day at the beach. We brought a cooler with bottled water and snacks. I also paid $10 to rent a boogie board for the day as well. Had we gone to Orlando, I bet we would have spent hundreds of dollars on tickets for attractions and expensive fast food. Beaches are a cheap activity, and also exploring national parks and other wild areas make for an enjoyable and inexpensive vacation activity. If we had more time, we would have visited the Kennedy Space Center which would have been inexpensive and memorable as well. On the trip down to Florida, we stopped at a Target to pick up healthy snacks and grocery items. In Florida, we stopped by a local grocery store to pick up snacks and food to prepare for meals. One problem we encountered was that we bought some hamburger and pork patties with the intention of cooking them with the oven at our hotel suite. Unfortunately, it turned out that our suite didn't have an oven, only a microwave. Plan B was grilling them at a charcoal grill that was available next to the pool at the hotel. When I went to grill the burgers, I realized that we would want some aluminum foil to put on the grill, plus some charcoal and lighter fluid. This cost of this meal was starting to add up. One of my kids found instructions for cooking hamburgers in the microwave using only paper plates. At first I was skeptical that this would work, but decided to give it a try instead of buying grilling supplies to cook the burgers. I checked the microwave burgers and found that they were hot and cooked all the way through. They were actually pretty good, and a lot easier to make than grilling on the road. By getting food at grocery stores instead of eating at restaurants, fast food places, and gas station convenience stores we probably saved hundreds of dollars. We didn't have much of a plan when we left on our road trip, and that's how I wanted it. The problem with making reservations ahead of time is that you are then tied to a plan which can add stress and forces you to keep track of time and try to meet a schedule. Plus some reservations are not refundable, so you could end up paying for a hotel stay even if you don't stay there. For the most part, Mrs. Penny Pincher checked for deals on Kayak with her smart phone at about 5 pm each day to figure out a good hotel deal. By late in the day we had a good idea of where we would want to stay for the night. We found a hotel on the beach that we liked at Cocoa Beach and ended up staying a second night. Look for a hotel that provides a free hot breakfast, this provides a good value when you are on the road, especially in expensive locations. Flying a family of 4 to Florida would have been an expensive operation. Instead, we drove my 13 year old Toyota Highlander with 155,000 miles. The cost of putting a few more miles on a car this old is almost nothing. On the highway, we got about 25 miles per gallon. For the round trip of 2,700 miles we use about 108 gallons of gas. At about $2.30 per gallon, this works out to $250. Sometimes you can find good airfare deals, but there's no way you could get 4 round trip tickets to Florida from Iowa for anywhere near $250. Even considering that we had to stay overnight on the way down and on the way back, driving was a lot less expensive than flying. Plus since we drove instead of flying, we had a car available once we reached our destination, avoiding the expense of renting a car. Today I spotted an awesome chair and ottoman (matching footstool) for sale at the local consignment store. It was in new condition and was very comfortable. But the exotic animal print on the fabric would not match the decor of most rooms. This is good news, because at the consignment store, prices are reduced by 50% after 60 days and reduced down to 80% off after 90 days. Due to the unusual fabric pattern, I think there is a good chance this chair could still be for sale after 90 days, and I could get this awesome chair and ottoman set for 80% off. The full price today was $150. Too much. At 50% off after 60 days, the price will be $75. Still too much. At 80% off after 90 days, the price will be $30. This works for me. In fact, this is a bit less than price I paid for the other chairs in my living room. I am planning to put the chair in a room with cedar paneling and nothing else that it needs to match, so it would be just right for me. My plan is to stop by the consignment store first thing when it opens on the day that the chair will be marked down to 80% off. For this plan to work, I'll need to figure out the exact date when it will be marked down to 80% off. 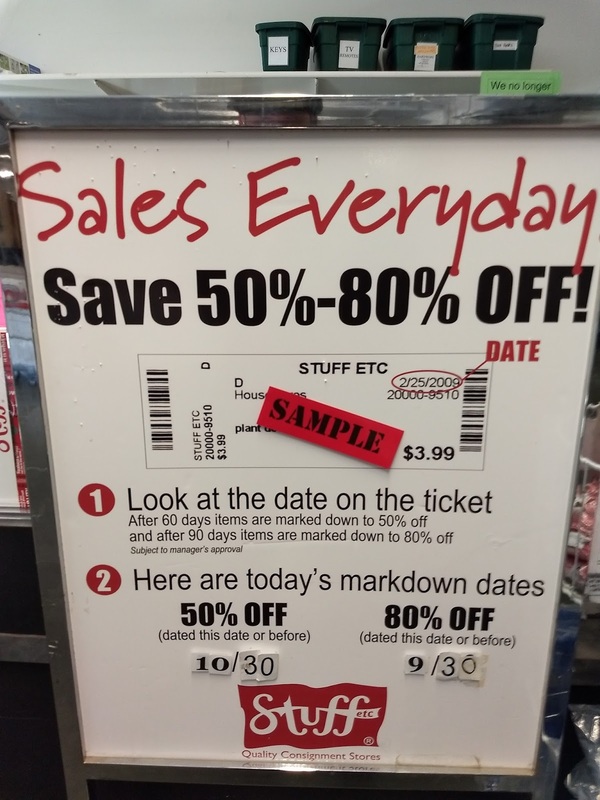 The example on the markdown sign for today on Dec. 30: items placed on the floor on Sept. 30 are 80% off, and items placed on the floor October 30 are 50% off. 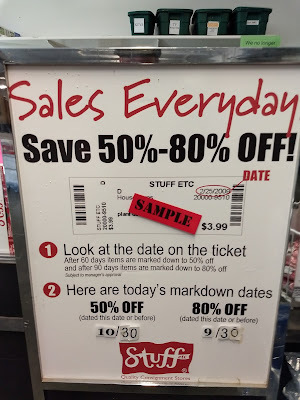 After checking out some duration between dates with an online tool to calculate the duration between two dates, it appears that items are marked down to 50% on day 61, and the markdown to 80% off happens on day 91. So when will my chair be marked down to 50% off and 80% off? It was placed for sale on November 19, 2017. Day 61 (50% off) will start on January 19, 2018 , and Day 91 (80% off) will start on February 18, 2018. I don't really care about the 50% off date since the price will be too high, except for the fact that someone else may decide to buy the chair when it gets marked down to half price. That is a risk I'll have to take. February 18 falls on a Sunday this year. I see that the consignment store opens at 11am on Sundays. So, I'll plan to pop in first thing when the store opens on this date and see if the chair is still there or not. If it is there marked down to 80% off, I'll be loading it up at about 11:05am! 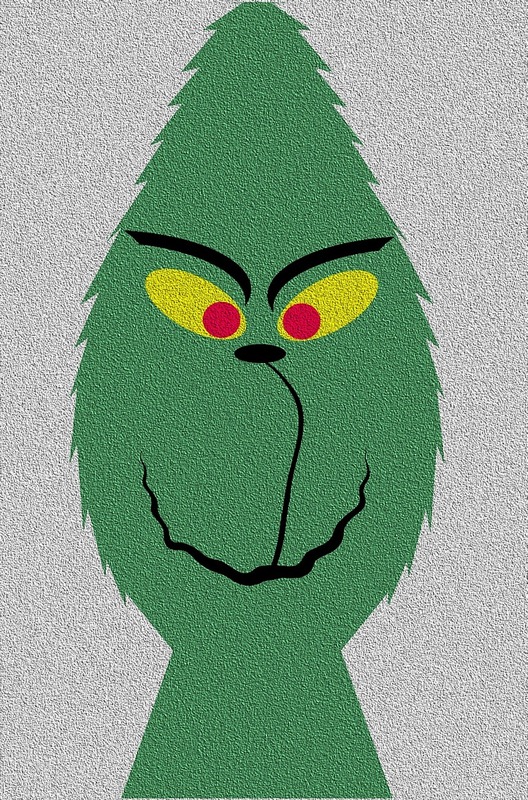 Skipping Christmas- Am I A Grinch? 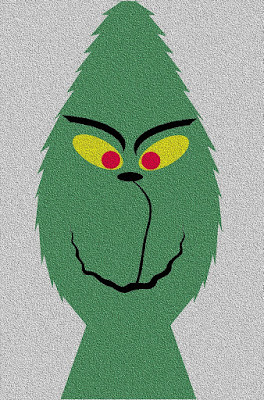 I hope no one calls me a Grinch, but I decided to skip Christmas this year. Running around buying expensive presents, and dealing with returning duplicate and defective items after Christmas seems like such a waste of time and money. Am I a Grinch For Skipping Christmas Presents? By "skipping Christmas", I mean skipping the buying presents part. We still put up the Christmas tree and we put up more outdoor lights than ever. But we'll also skip the buying candy to put in stockings part. Stocking stuffers are expensive, and everyone in my household has pretty much moved on from eating candy. This year we plan to use the money we save from skipping the presents for a road trip instead. I like the idea of getting an experience as a family instead of buying more stuff that we don't need. With our youngest graduating from high school soon, this may be our last road trip as a family unit. Not only did we save money on the cost of presents, but we didn't pay for gas to drive around buying presents, we didn't spend money on shipping for presents, and we won't end up making additional purchases sparked by presents. For example, if you buy your kids a new video game console, you are setting yourself up to buy hundreds of dollars of games in the future. Plus, by skipping the presents, we conserved natural resources that would have been consumed for manufacturing the presents, packaging them, and wrapping them to put under the tree. How would you feel about skipping Christmas presents to save money, conserve resources, and reduce stress and hassle? I took my lunch to work like I do almost every day. As usual, I carried it in my giant insulated lunchbox. 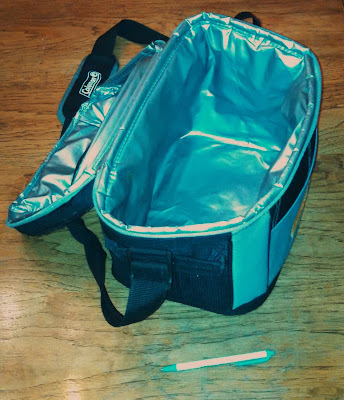 This lunchbox is HUGE- check out how big it is compared to the pen next to it! 1) About 1 cup of raw "baby" carrots, 30 days past the "use by" date on the bag. I count these as free since they were basically rescued from the garbage. 2) A small container of guacamole with garden vegetables that no one at my house liked- including me! My wife said to just throw it away, but I decided I would be hungry enough at work that it would taste good. This trick worked. Things do taste better when you are hungry. 3) A few corn chips for the guacamole. I took a bag from home that was already open and brought it back. The entire bag cost about $2.50 and I would say I took about 50 cents worth of the chips. 4) Office baked macaroni and cheese. We had some leftover plain pasta noodles from dinner last night. I added a pat of butter in the glass Tupperware container when I packed the noodles in my lunchbox. I also brought a small hunk of cheddar cheese. I used the real knife I keep at work (don't worry, it is only a bread knife and is OK to have) to slice up the cheddar on top of the noodles and butter before microwaving. This turned out pretty well. I am sure no one would have eaten the noodles. The butter was probably 10 cents worth, and the cheese maybe another 50 cents. Expired carrots, let's call them free. Unwanted guacamole, let's call it free. Corn chips from an already opened bag, let's call it 50 cents. A pat of butter and a small block of cheddar, let's call it 60 cents. OK, so it wasn't a free lunch, but as they say... there's no such thing as a free lunch! I have saved tons of money over the years scavenging stuff from home to take for lunch and snacks in my giant lunchbox. I try to grab stuff that would otherwise get thrown away and have it for lunch, as long as it is not spoiled. If you haven't developed the habit of packing and taking your lunch, you are missing out on an easy way to eat healthier and save some real money. This picture of my $450 pickup truck still makes me smile. I saw a classified ad in the paper (this was a few years ago) for a pickup truck for sale for $500. I called the number and arranged to go and check it out. The truck was owned by a young guy with a big bushy beard who literally lived on the edge of a dump. He had built a homemade topper on the back of the truck, which seemed to be in OK mechanical condition for a 16 year old vehicle. As I was checking the truck out, he mentioned he needed some money for the weekend coming up. I offered him a check for $450 and he signed over the title. I was the proud owner of an older vehicle! The only thing this truck needed was a new gas cap. I drove it for a year with no problems at all and then sold it. The car I drive now is 13 years old. It is in better shape than the old Dodge Ram pickup, but it has some quirks. One window does not work, and I taped it closed with duct tape as a permanent repair. The most obvious advantage of driving an older car is cost. Older cars are less expensive to buy, and it is much more feasible to buy an older car with cash instead of financing it and making payments every month. I have made car payments that are more than $450 per month, but if you are willing to drive an older car, you can buy it outright for the cost of only one car payment. Another thing I like about driving an older car is you don't have to worry about depreciation. Once a car has a lot of miles on it, the amount of value that is reduced by driving more miles is almost nothing. But the cost of putting miles on a new car is very expensive in terms of depreciation and reduction of resale value. When you drive an older car, you celebrate putting more miles on it instead of dreading it like you do with a newer car. Older cars are much less expensive to insure and registration fees for older cars are almost nothing. 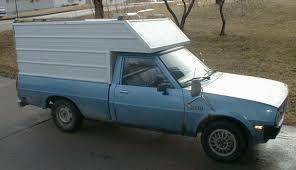 Plus, with an older cars many repairs are optional. 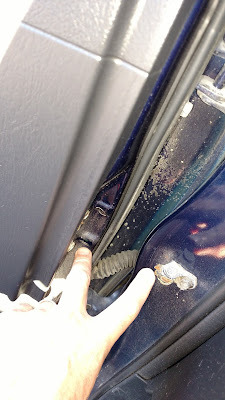 I was just telling my kids a story about the time when I was in college and someone bumped into my car when it was parked on the street, scraping it. 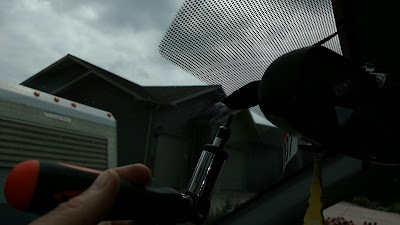 The person left a note on my windshield offering to file a report with his insurance company to get it repaired. I called him and told him not to worry about it. 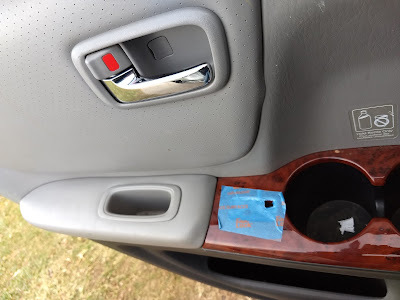 If I had a newer car, I would have worried about it. 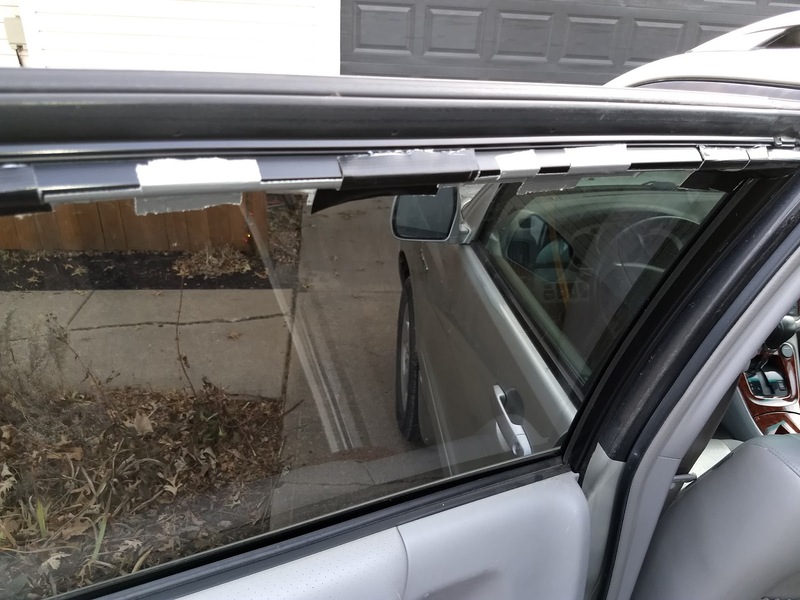 Another example of this is the broken window that I repaired with duct tape. I wouldn't be able to save money and hassle by doing a quick homemade repair like this if I had a newer car. One of my favorite things about my current old car is that it is loaded with features such as heated leather seats, a sunroof, a towing package, and a 6-disc CD player and awesome stereo. When you are buying an old car, it doesn't cost much more to get one that is fully loaded with the most expensive options. You can always find a nicer, more expensive car with better features. But it is hard to beat an older car that runs and that is paid off! The Saturday after Thanksgiving I was at the grocery store with Mrs. Penny Pincher to pick up a few things. 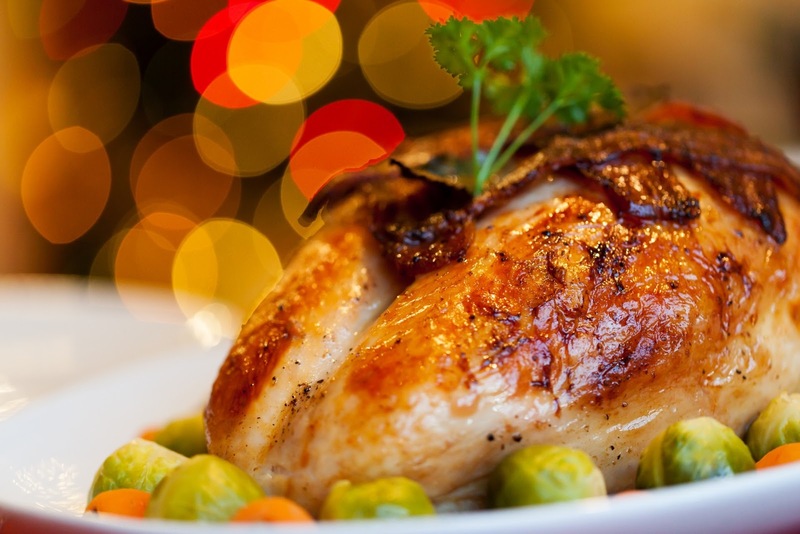 As I walked the aisles, I wondered if there would be an overstock of turkeys that could be had at bargain prices. I figured that the store would not want to risk running out of turkeys before Thanksgiving and would err on the side of having too many. I learned I was right about my suspicions of a turkey overstock when I came across a 15 pound turkey on sale for $4.11. It was in a refrigerator case, so I wouldn't even need to mess around with thawing it out. I could just pop it in the oven and gets 15 pounds of really easy and really cheap food. Apparently someone had ordered this one (it had a name written on a tag), but had not picked it up. There were 5 or 6 other defrosted turkeys of similar size and price. Next year, I'll plan to go bargain hunting for defrosted turkeys on the day after Thanksgiving. We ended up eating the turkey for several days, including lots of slices of turkey meat and even made a turkey casserole. I wonder if I could pick up a cheap ham after Christmas? Savings: Probably about $15 vs. buying a turkey at full price. Having cheap food around instead of buying other things for lunch and dinner for a few days probably saved even more. Return Without Receipt, and Without the Box! 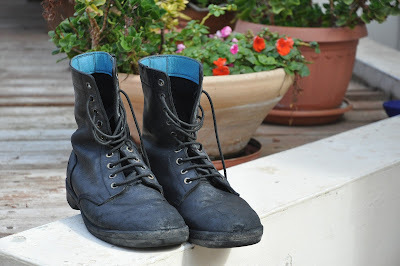 Deboot, verb: To return unneeded boots and get much-needed cash. In extreme cases, this can be done even after the box is recycled, and without a receipt. The other day, my wife showed me some boots she had picked up at Kohl's sometime within the past few weeks. She mentioned that they pinched her feet and she wanted to return them. On one hand, this was great news. She got the fun of shopping and getting new boots, and it wasn't going to cost anything. We could get the money back, plus we would regain valuable closet space. But the bad news is that I remembered recycling the box. I usually save boxes for a few weeks after a purchase in case we need to return an item. But I knew this one was long gone. "Do you have the receipt?" I asked. Mrs. Penny Pincher said it was probably in her purse. After a thorough search of her purse, her car, and the recycling bin, I concluded that the receipt was also gone. So we had some unwanted boots with no receipt and no box. But we knew what store they were from, and she knew she used one of the credit cards in her purse to buy them. I was willing to give returning them a try even though I knew it would be a challenge. I found a Kohl's bag to carry the boots into the store. It wasn't as good as having the box, but at least it conveyed that the boots were bought from that store. When I reached the front of the return line, I explained that I needed to do a return without a receipt. They said they could look up the purchase if I had the credit card. I started going through my wife's collection of credit cards from her purse. We checked her Kohl's card, and it wasn't that one. We tried a U. S. Bank card, and it wasn't that one. We tried looking up her Kohl's reward card number, but this also failed. We tried another U. S. Bank card and it was a winner! 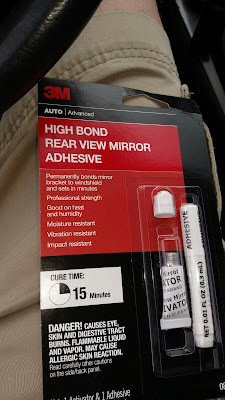 The entire process of doing a return without a receipt and without the original packaging took only a few minutes. It was well worth it to get over $33 back and avoid wasting a pair of boots that were not needed. What if you paid cash instead of using a credit card? Doing a return without a receipt is easier if you used a credit card since there is a record of the transaction that the store can look up. You might still be able to return the item even if there is no record of the purchase, but you might get store credit instead of a refund. Also, you might get the lowest sale price for the item instead of the price you paid. The other day, my son and I took my wife to the fabric store. After a few minutes, my son and I decided to leave my wife to shop in the fabric store (risky, I know...) while we went next door to check out the pawn shop. High on my list of things to look at in the pawn shop was binocculars. I have been looking for a good pair of binocculars for a few years, checking out every pair I could find at consignment shops and garage sales. I was excited to see that the pawn shop had five pairs in a glass display case for sale ranging from $15 to $70. I had the lady working in the shop come over and open the display case. Unfortunately for her, she had to stay right there the whole time the case was unlocked. I tried out the binocculars by looking out the window at nearby buildings and also by trying to read price signs across the store. The binocculars I tried looked cool, but the optics were terrible- even the $70 pair produced blurry results. The last pair in the case looked older than the rest and was a little beat up. I figured I might as well try it since it was priced at $15 and it was the last one. 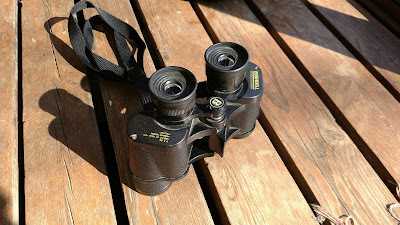 Much to my surprise, this pair of binocculars worked great! It has an easy-to-use lever mechanism to adjust the focus. I could read the price signs clearly from all the way across the store. I could see bricks and small details in the building through the window. My quest for a good pair of binocculars is over! With spring fast approaching, there was a clearance rack of leather jackets displayed. Some of the jackets looked really expensive, but were priced at $15. My son tried one on and liked it, except it was a size too big. He thought about getting it anyway, but I convinced him that it was just too big. When we later met up with my other son and told him about the leather jacket deal, he said it is a bad idea to get the wrong size of something, "it's just not worth it." They had lots of bikes for sale, but I thought the prices were too high. This may be due to the spring season- I may check back around October 15 to see if they have any bargains. They had a lot of power tools for sale, but these looked heavily used and well worn. I would definitely want to try out the tools from the pawn shop to make sure they are in good working order before buying. Some of the tools were battery powered, and I would worry about the battery being near the end of life and not being able to hold much charge. The video game selection seemed to be for very old systems and seemed to be pretty well picked over. They had a few old laptops, but they didn't look much better than the old laptop I already have, and these were priced at a couple hundred dollars. I woud rather find a bargain laptop in the open box bargain area at Best Buy than take a chance on one from the pawn shop. At least there would be some opportunity to return a laptop from Best Buy if there is a problem with it. 1) You can't judge a book by its cover. The oldest, most beat up binocculars were by far the best and quite a bargain at only $15. I bet most people wouldn't have even tried them due to their rough appearance. 2) If you want cheap leather jackets, go to the pawn shop in mid-March. 4) I found power tools at the pawn shop, but they looked pretty well worn. Maybe you could buy a cheap power tool at the pawn shop as an alternative to renting one for about the same money. 5) The good electronics and games get snapped up quickly, you would need to check frequently to find something decent. 6) If it doesn't fit, you must acquit... This is a lesson I wish I had mastered long ago. Many times, I have found a bargain coat or even shoes that didn't quite fit- but I bought them anyway because they were priced way down on clearance. As son #2 said, "it's just not worth it." 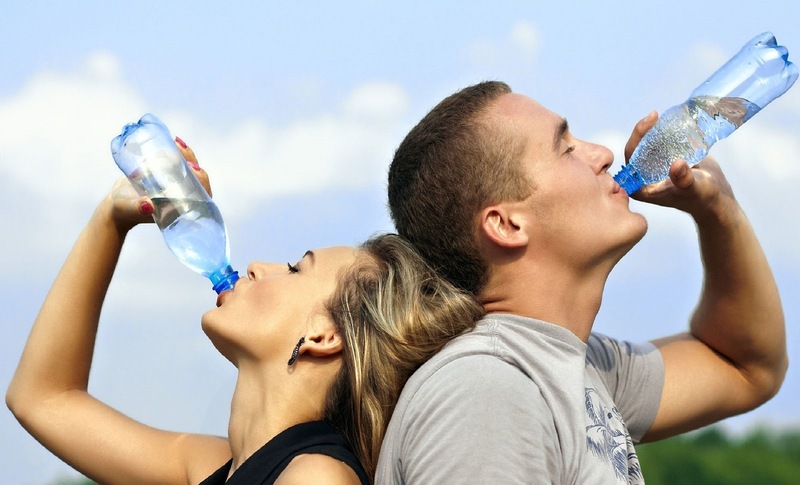 Why People Are Now Drinking More Bottled Water than Soda? But You Can Get Water at Home for Almost Free! An article on Fortune.com a few days ago announced that Americans are now drinking more bottled water than soda. Why!? At least drinking water is healthier than drinking soda, but it is stunning to me that so many people are paying for water- something you can get for almost free! Bottled water has a high cost not only in the price you pay at the convenience store or vending machine, but also in environmental impact. It takes a lot of energy to transport a heavy product long distances to the store and keep it refrigerated. Even if you recycle the plastic bottle every time, it still takes energy to produce the plastic bottle in the first place and then to melt it down to recycle the plastic, not to mention the energy to haul it to the recycling facility. This seems like an unbelievable business model- package something that costs almost nothing that people can easily get at home, and sell it with a huge markup. If someone came to me with a business plan like this, I would probably shoot it down. Why would people pay for something they can get at home for almost free? I decided to dig further into this psychological puzzle. When people buy bottled water, it must makes sense to them in terms of economic value. That 20 oz bottle of water with less that 1 cent worth of water priced at $1.39 seems like a good deal. Why? Social Factors. Some bottled water purchases are due to the force of habit of buying a drink when you are out and about, or if you are with friends who are all buying a drink then you want to buy one too. But you don't have to be like everyone else, being efficient with money and reducing your impact on the environment is a respectable choice. Status Symbol. People feel they deserve bottled water. They are smart, work hard, and make good money, so they should be able to at least get a bottle of water when they feel like it. This is a good example of "lifestyle inflation". Perceived Quality. A product that is sold in a bottle in the store must be better than what you can get at home right? Most bottled water is sourced from municipal water supplies- in other words, it is tap water just like you can get at home! Bring your own water from home in a reusable bottle. Get a water filter at home if needed to improve taste/quality. I use the water filter in my refrigerator. How to keep it cold? Freeze your bottle (or freeze a 1/2 full bottle and top it with water before heading out), use a cooler, or put your bottle in the fridge at work. Or simply use a water fountain for drinking or filling a cup with free chilled drinking water from the water fountain. I even added some new items in the Penny Pincher Journal Store to help you save money by drinking your own water from home in refillable bottles for almost free instead of buying expensive bottled water. Labels: Frugal Living, Ways to Save Money, Why Are Things So Expensive? How much electricity- and money- does it waste to leave the TV on? Too much! As a young child during the energy crisis of the mid-1970's, I remember seeing distinctive stickers encouraging people to save electricity. The black sticker was sized to fit over a light switch and said "Kill-A-Watt" in bold white letters. The stickers were meant to remind people to turn out lights when leaving a room. I must say, I learned this lesson well. I am quite good about turning off unneeded lights whether I am leaving a room or not. My son once pointed out that he knew it was me coming down the stairway at night because I turned out the lights BEFORE coming down the stairway in the dark. Who else would do that? Tonight I was working on writing some new articles that are due in a few days. I noticed that the TV was left on in the living room and no one was watching it. I started thinking about how much energy- and money- that was wasting. I knew from looking it up in the manual that the TV draws about 300W. I also knew that the cost of electricity here is about 10 cents per kilowatt hour. That is pretty good, the average in the USA is around 12 cents per killowatt hour. If you are curious, you can find average electric rates for your state listed in this NPR article. I figured it would take me about 15 minutes to finish the outline I was working on. 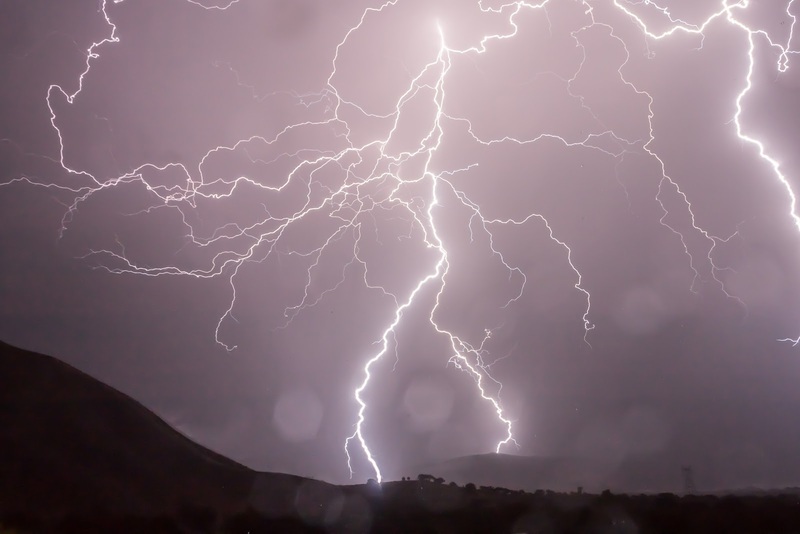 Since the TV was drawing about 1/3 of a kilowatt per hour, it would cost about 3 cents to run it for an hour. This works out to about 0.75 cents if I were to leave it running 15 minutes while I finished my article outline. In this case I didn't save much electricity by turing the TV off right away, but I did save energy worrying about it. Some people would say, why worry about wasting a few cents and a little bit of electricity. I say, why waste any at all? How Hard Would You Work to Get a Refund? Who Wants The Money More? I recently made a big improvement to my kitchen- quartz countertops! After a couple years of using some mismatched old laminate countertops, and even a bar area that "temporarily" used boards nailed down to make a sort of countertop, I finally got real countertops. These fancy countertops should last a lifetime, and will improve the value of my house quite a bit. We ordered the countertops through Lowes (I had an offer for 11% off!). 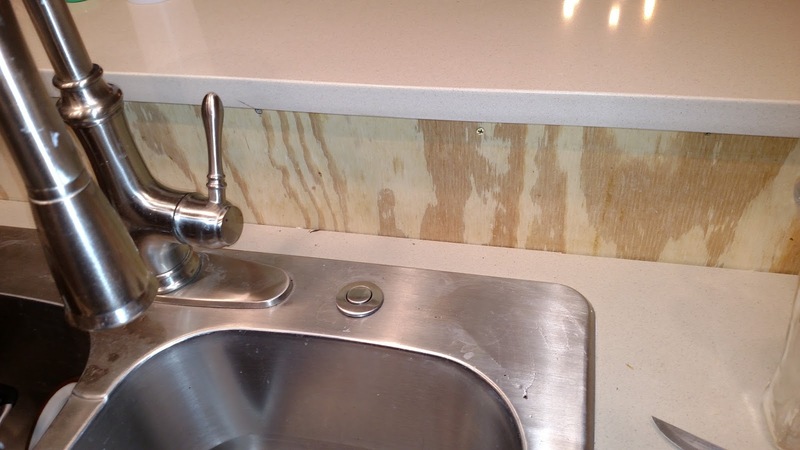 Lowes works with a subcontractor in the area who handles measuring, cutting, and installing the countertops. The installation went great, except for one minor change of plan. The quote we got included installing a backsplash made of the quartz countertop material across the nearly 9 foot length of the main countertop where the sink is located. Since this is a long run, the plan was to take measurements for the custom backsplash piece after the countertop was installed. Then the piece would be cut, and another trip would be required to install it. This all made sense, except when we saw what the countertop looked like, we decided to go with a tile backsplash instead of a giant piece of quartz countertop. The quartz backsplash would have been nice, but it would have been a lot of the same color and pattern to look at. So I called the installers right away and told them not to cut the custom backsplash piece and to cancel that part of the work order. Now for the fun part- getting the money. The cost for the backsplash quartz piece plus the extra labor for a second trip to bring it out and install it was around $450. The problem with this situation is that both the subcontractor and Lowes are happier if this $450 is forgotten. I am the only one who comes out ahead if the bill gets corrected. On my call to the subcontractor to cancel the backsplash, I mentioned a price difference. The initial response was that the backsplash wasn't included in the total, so no refund was in order. But I knew it was. I had the person pull up the quote to find the extra amount for the backsplash and verify that it WAS included in the total. She finally agreed and said they would work on correcting the bill and would contact Lowes with an updated (reduced) bill. I am pretty confident that after a few more calls I will get my $450. I am the only one that is going to benefit from correcting the bill, and everyone else loses. This means that the ball will be in my court to follow up and make sure that this does not get forgotten. I am also pretty confident that I would not have gotten the $450 if I hadn't taken some initiative to track it down and go get it. Sometimes it comes down to who wants the money more. Update 1: After 6 weeks, I think the battle is nearly over... I called Lowes a number of times to ask for a price adjustment, but nothing was happening. The latest response I received stated that they didn't think the backsplash was included in the original total, so there would be no price adjustment! Talk about frustrating! I decided to stay calm and friendly though and handle this like a problem that needs to be solved in the most efficient way possible. I called the countertop subcontractor (again). I confirmed with them that the backsplash WAS included in the total (again). I asked them to send a letter to me with the total. 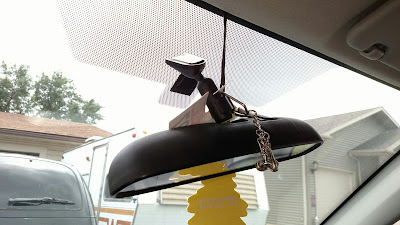 This was a problem, however, since they say they have to keep their rates confidential since they are a subcontractor. I asked if they could send a statement (again) to the person at Lowes stating that the backsplash was paid for, and what amount should be refunded. Then I called the person at Lowes and let her know that the countertop company is sending the amount to be refunded. About an hour later, she called back and said the refund was being processed. This sounds promising, but I want to see the money before I am convinced that this really did work out. I knew getting this refund would be a challenge since I was the only one who would benefit, and I was right!